Simeon took [the child Jesus] in his arms and praised God, saying, ‘Master, now you are dismissing your servant in peace, according to your word; for my eyes have seen your salvation’ (Luke 2:28-30). Those words stand at the center of this evening’s feast, the Feast of the Presentation. They are beautiful words by which Simeon tells the story of his life. But what about us? What about our story and our life? What good is it to us if Simeon receives into his arms the child Jesus and we do not? What good is it to us if Simeon’s eyes see salvation and our eyes do not? What good is it to us if Simeon is free to go in peace if we are not? It’s not enough to come here this evening to simply celebrate Simeon receiving the child, Simeon’s eyes seeing salvation, and Simeon being set free to go in peace. If that’s all we do, if that’s all this feast is about, then we have bound this story, this feast, this good news, to a time long ago and a place far away, and it doesn’t have much to do with our lives. We must let the truth of this story transcend its history. While there is historical truth to this story, there is also a cosmic truth, a truth that is not limited by time and place. This story is an archetypal experience that is happening in all times and all places for all people. The truth of this story is happening here and now for you and me. It is as much our story as it is Simeon’s. If we want to understand and claim this story as our own and not just Simeon’s then strangely enough we need to know a bit more about Simeon. So I want to tell you what our sacred tradition says about Simeon. Tradition says Simeon was one of the seventy translators of the Hebrew scriptures into Greek, what we call the septuagint. That translation is supposed to have begun around the third century before Christ and was completed in the year 132 before Christ. Are you doing the math here? That means Simeon was a really old guy. One strand of the tradition says Simeon was 270 years old when Jesus was presented in the temple. Another strand of the tradition says Simeon died at the age of 360. Now let’s not get stuck on his age; whether he really was that old, and how someone could live to that age. That’s not the point. I think the better question is, What does it mean for us that Simeon was that old? What is the tradition trying to tell us? Well, you have to know another part of the story. Our sacred tradition says that Simeon came to that verse in Isaiah that says, “Behold, a virgin shall conceive and bear a son” (Is. 7:14). This made no sense to Simeon and he was going to substitute “a young women” for “a virgin,” when an angel stopped him and declared the verse to be true, and promised that before he died Simeon would see the child of this virgin. Simeon’s life was one of expectation, anticipation, and waiting. And who among us has not had his or her life characterized by expectation, anticipation, and waiting? We’ve all stood in that place waiting for and needing something to happen, living in expectation and hope, anticipating the future, and wondering if today was the day. We got up each morning and had to decide whether we still believed in God’s future or whether we would give up. We all know what it’s like to wait – waiting for life to change, for the grief to go away, for a prayer to be answered, for joy to return, for forgiveness and reconciliation, for clarity about a decision, for meaning and purpose, for healing and new life. We wait and hope for all sorts of things. We have all sorts of hopes and expectations for what God is doing in our lives and our world. I think we all come here this evening with some hope, some need, some expectation. We come here tonight trusting and anticipating the promise that God is present and working in our lives even if we can’t see or clearly understand what it might be. So we show up and we wait for the miracle. That’s what Simeon did. So what’s the miracle for Simeon? For us? I don’t think it is that Simeon lived to such a great age. And it’s not that Simeon held the baby Jesus. And it’s not that Simeon’s eyes saw salvation or that Simeon had been set free to go in peace. Those things are happening all the time. The presentation of Jesus is all around us. So what’s the miracle for Simeon? Here’s what I think the miracle is. Simeon continued to show up. He continued to be vigilant and attentive. He continued to trust the promise. He continued to wait with hope and expectation. He never despaired. He never walked away from the promise. The miracle for Simeon and for us is in the showing up. Sometimes showing up is the most difficult work we do and it takes all we have to just show up. But it’s always the question before us. Will we continue to show up? Will we be awake and vigilant? Will we live with hope and trust? Showing up is the means through which God fulfills the promise to us and to Simeon. Simeon thought he was waiting for the child to show up but what if it was really Jesus waiting for Simeon to show up? 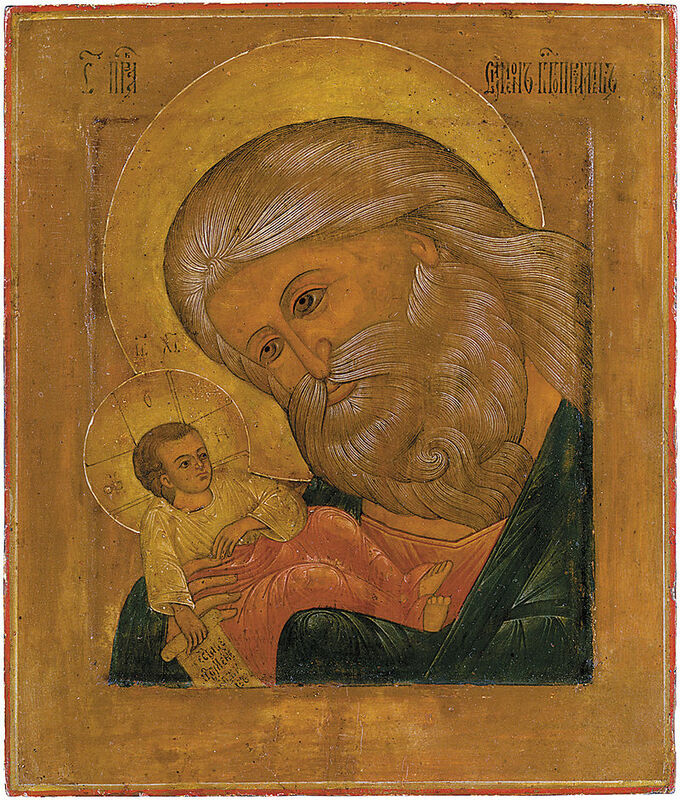 Simeon thought he was presenting the child to God but what if it was really the child presenting the old man to God? Every day that Simeon showed up the child Jesus was seeing and upholding Simeon. That’s what this feast is about, and I learned that from an old lady named Jimmie. When I was at my last parish we had a weekly Eucharist and healing service. Every week Jimmie showed up. Every week Jimmie’s caregiver would lead her by the arm and help her find a place to sit. Jimmie was essentially blind and often confused and unaware of what was going on. Her caregiver would lead Jimmie up to the altar rail. She would kneel down, look up at me, and say, “For my eyes and for my mind.” Every week I anointed Jimmie with oil, laid my hands on her head, and prayed for her eyes and her mind. And then her caregiver would lead Jimmie back to her seat. When it was time for communion Jimmie’s caregiver brought her back to the altar rail. She held our her hands to receive the body of Jesus, the Messiah, the one whose name means salvation. This happened week after week. Jimmie continued to show up every week for the two years I was there. It was always the same. “For my eyes and for my mind.” Every week Jimmie was just as blind and confused when she left as when she came. I couldn’t help but wonder what was going on here. Then one day it struck me. This is Simeon. This is the power of showing up. Somehow in Jimmie’s showing up she understood with a confused mind what I didn’t get; that Jesus was presenting her to God. She saw with eyes that were blind what mine could not see; her own salvation. Every week she came and she experienced this, and every week she was set free to go in peace. Her showing up was the fulfillment of God’s promises in her life. She showed up to the Christ, to salvation, to freedom from blindness and confusion, and to peace. She showed up to claim what was always already hers. She showed up to the reality of her life. What Simeon and Jimmie experienced can be ours too if we but show up. The presentation of Jesus doesn’t happen in the Jerusalem temple but in the temple of our lives, every moment of every day, day after day, month after month, year after year, decade after decade. It happens in the midst of waiting. It happens every time we show up to the reality of our lives. Let’s show up and claim what is already ours. This has helped me to really understand the words ‘showing up’ that one hears all the time. Thank you! Thanks Nikki. I am glad the sermon was helpful. I think showing up is some of our most important work and a key to life and faith. Thanks for this Father Marsh – and for the wonderful icon of Simeon. The Nunc Dimitus has been on my mind lately, and I realized when I read your peace that as an older person I am suddenly very worried about the world we are leaving the young. 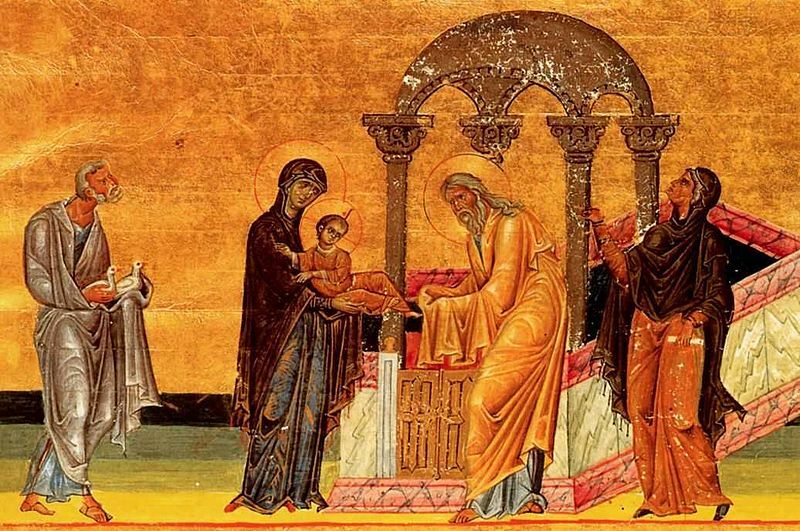 Simeon got “dismissed in peace” because he knew that the world was about to get its Savior. I pray for that kind of peace for all of us. But, as you point out, maybe I just need to keep “showing up”! Cheryl, I was really struck by the icon of Simeon, especially his eyes. I suspect there are many that share your concern. I join you in praying for peace, and the grace to continue showing up. This is lovely. The feast has passed but this is worth a read. Because you keep ‘ showing up’…. in total faithfulness to your vocation, family,church community, online offerings, spiritual challenges & expansive mercy, hope & certitude that we also receive and accept the (showing up) grace offered. I thank you for the reminder that we must stand in Simeon’s shadow. Miriam, thank you for your very kind and generous words. They mean a lot to me. I’ve also come to realize that while we must each do our own showing there are many who encourage, teach, guide, and support us in that showing up. You are one for me. Thank you. Thanks Mike. It just makes me miss you more. Thank you Betty. We miss you as well. Peace be with you. Previous Previous post: Is It A Good Or A Bad Thing?